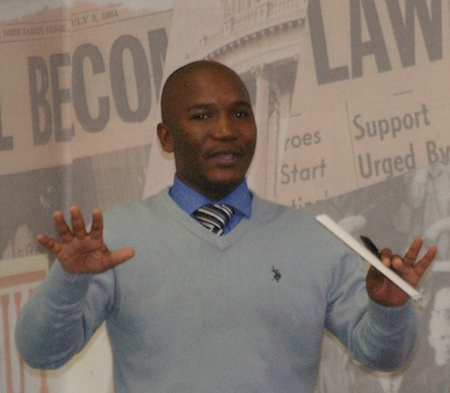 As a former student leader at the University of Zimbabwe,33 year old Mfundo Mlilo has been an active campaigner for human rights and democracy in Zimbabwe. Currently Mlilo is the Director of Combined Harare Residents Association (CHRA) a non partisan organisation that advocates for a better service delivery in the commercial capital, Harare. CHRA has been instrumental in campaigning for the scrapping of pre paid water meters that the city of Harare intends to install in residential areas. So far it has petitioned parliament to scrap such plans citing economic challenges facing citizens. “We have been campaigning for the scrapping of these meters since we believe that water is a basic human rights. A lot of people are unemployed and if they make people buy water, life will become unbearable and disease outbreaks like cholera will hit hard on the poor residents of the city. Council has to stop such plans and we will not tire. They must first improve on the water situation in the city as well as on its quality before they roll out this project,” said Mlilo. This followed a visit of detained human rights activists at a remand prison. “I was detained following a prison visit and the authorities accused us of violating the law. Currently I am out on bail and this will not deter my work as a human rights defender, “he said.